Like the word awesome, the depth and meaning of the word great has lost some of its intensity due to overuse. But in order to begin to understand the Great Depression, its important to first understand why it was considered capital-G “Great” in the first place. It may be useful to consider it in comparison to the first World War. Until the massive destruction and turmoil wrought by World War II shocked the world, the First World War was called the Great War because of its the global scale and consequences, as well as its new styles of trench warfare and use of new technologies. Much like the Depression, The Great War had Great Consequences, and a fundamental change occurred in the world. The United States emerged from the war relatively unscathed. It became a creditor nation, meaning that other countries owed money to the United States. It was a powerful position to be in. Other European nations, even many of the victors, ended World War I saddled with heavy war debts, structural damage and years of lost productivity in the workforce. To make matters worse, they often found they were unable to sell their goods to Americans, as workers in the United States continued to overproduce their own goods for domestic consumption and the federal government enacted protective tariffs. The aftermath of the Great War served as the precursor to the Great Depression and foreshadowed the scale of the global devastation it would trigger. Pre-war power dynamics were completely upended and the United States now held a new, more prominent position in the world. When the U.S. stock market crashed on Black Tuesday, the repercussions were felt worldwide and already-fragile countries were forced to deal with economic calamities as well. 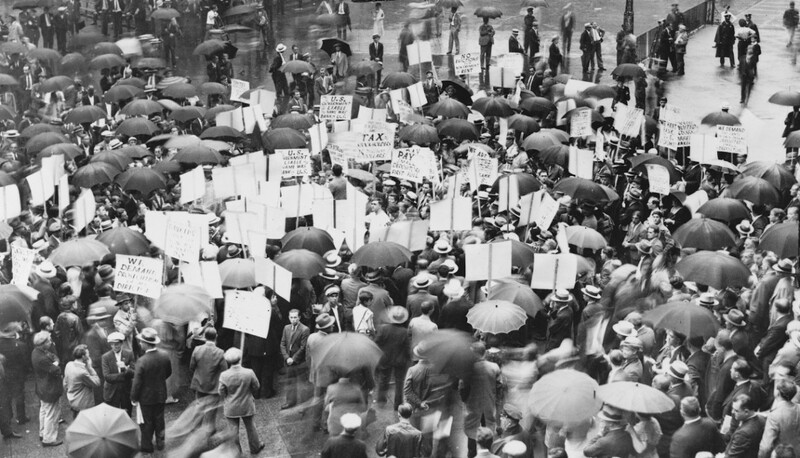 Although historians generally agree on the factors that contributed to the Great Depression, there is a great deal of debate surrounded the principal cause. In the clip below, Robert P. Murphy presents an overview of the different economic schools of thought about the causes of the Great Depression. His lecture can get a little information-dense, but Murphy does attempt to clarify his points for people new to the topic. Stanford Historian David Kennedy also comments on the origins of the Great Depression. Despite hints of economic instability throughout the 1920s, many people, including respected economists, assumed that the market would continue to rise indefinitely with a permanently high plateau of prosperity. But this prosperity was based on speculation rather than true value, and on Black Tuesday, stocks plummeted in the worst downturn in the history of the New York Stock Exchange. The following clip gives a good five minute overview of Black Tuesday and the beginning of the Great Depression. This clip from the History Channel also explores the beginnings of the Great Depression. The editing is overdramatic and inexplicably features a talking head from Sheryl Crow, but it also includes some impressive visuals. The following clip explains how the banking crisis exploded during the Great Depression. When confidence in banks deteriorated, people rushed to remove their money from banks, causing bank runs and often leading to the failure of the bank. For a more in-depth study of the Great Depression, see the following PBS documentary of the Great Depression. This feature is packed with Depression-era footage and interviews with people who lived through the Depression. Visit the U.S. History Scene reading list for the Great Depression.